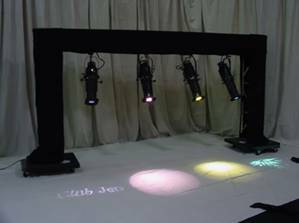 In addition to Trusswraps™ that completely enclose the truss with only one Velcro™ seam, a new convenient system has been developed for hanging truss, and ground-supported arches and cubes. The TrussCover System™ has been developed with four Velcro™ seams. These seams allow easy access for hanging instruments and pulling cables. The TrussCover System™ is constructed with four independent sides that are connected with Velcro™ strips. The top panel of a flown truss can be removed and the front and back panels are then connected with wide bands. This is to facilitate cable, rigging, and motors. As the fixtures are focused, the bottom panel is attached to the front and rear panels using the Velcro™ strips. Custom three-way corner blocks and inline covers are used to completely cover the truss.